All the master cylinders used on our coaches can be found listed under Chevy/GMC 1971-1992 P30 van applications. There were a wide variety of units available for those vehicles though, and many are not usable on a GMC Motorhome. Which specific unit you select depends on what will fit and what is sized appropriately for the installed brake system components. Master cylinders are generally selected according to the piston bore size. The tradeoff in bore size is between pedal effort and pedal travel. Pedal effort is how hard you have to push on the brake pedal for maximum braking effectiveness. Push any harder and the wheels will skid. Pedal travel is how far you have to push the pedal or, in other words, the pedal height. If the travel is too much, the pedal will run into the floor before the brakes are engaged. The bigger the bore, the more fluid can be moved in the same travel, but the harder you have to push the pedal. Both Manny's brake kit and the TSM kit, which has the same size calipers, have been successfully used with the standard 1-1/4" master cylinder such as the Wagner F79821, Raybestos MC39075, or ACDelco 18M92. These units closely match the original so require no changes to brackets or brake lines, but there are some limitations. 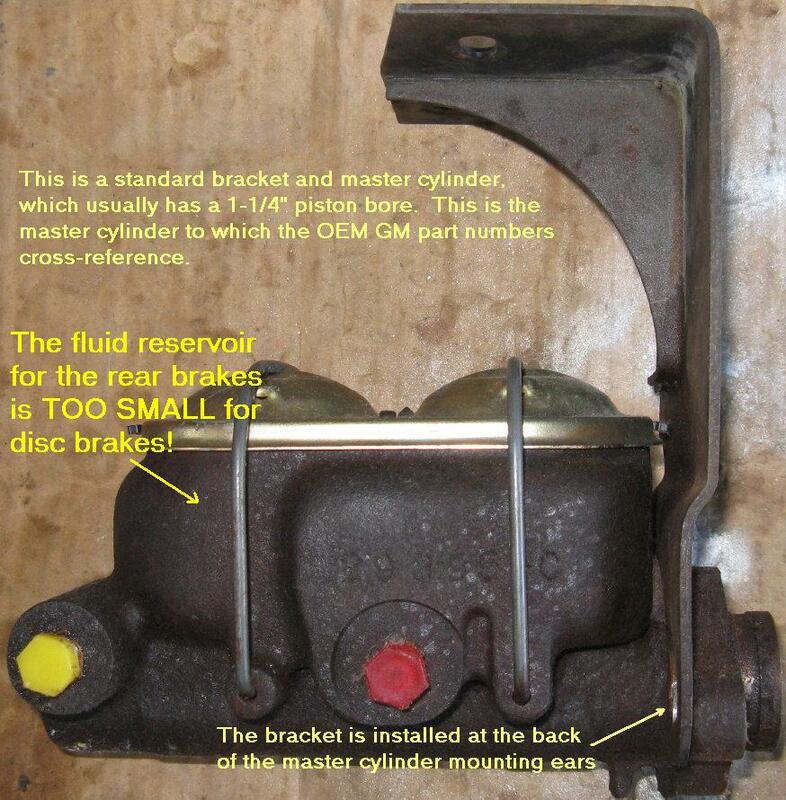 PLEASE NOTE: The rear brake reservoir on the standard master cylinders is about one third the size it should be to fully compensate for caliper brake pad wear. If you use this type of master cylinder, you MUST periodically top off the brake fluid, or add a separate reservoir to increase capacity. In addition, bigger calipers, flexibility or looseness in caliper mounts, loose bearings, distorted rotors, bent brackets, soft hoses, etc, all add to the required piston volume. The standard master cylinder MAY not provide good pedal height for your particular installation. NOTE: On our coaches, pedal height is a bit misleading. The pedal can't run into the floor because the back of the pedal arm will hit the firewall first. To test, push hard on the brake pedal and reach down to feel how much clearance there is behind the pedal arm. Another common choice is a 34mm (or 1-5/16") master cylinder with a large rectangular fluid reservoir. This size master cylinder provides sufficient bore and reservoir capacity for an all-disc brake system, but also has some drawbacks. By my calculations, a 34mm master cylinder will require roughly 50 lbs more pedal effort than a 1-1/4" for the same braking effectiveness. A Raybestos MC39309 is shown in the picture. Other part numbers are given below. 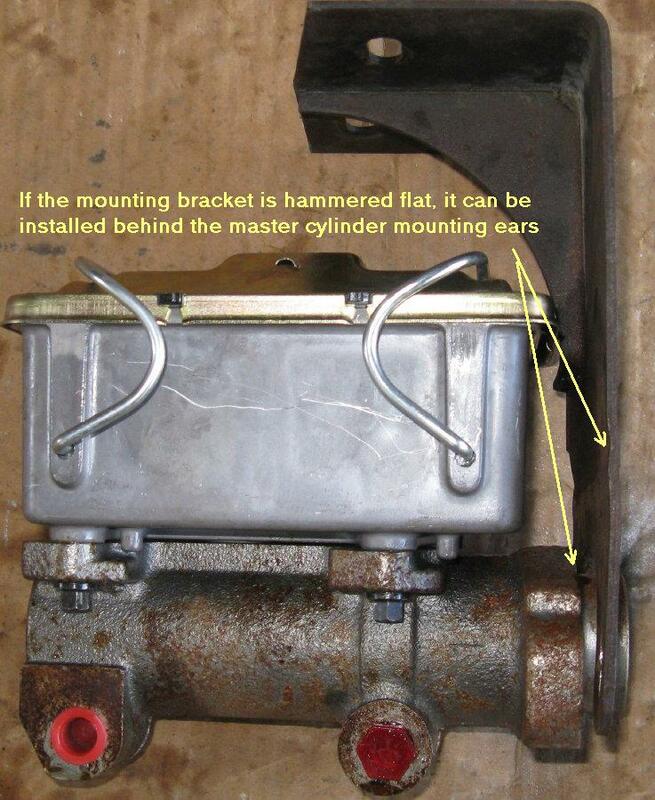 If you install a 34mm master cylinder, the original bracket must be modified to fit. There are several ways to do this. You can use the original mounting bracket by flattening the bracket and installing it between the brake booster and the master cylinder. 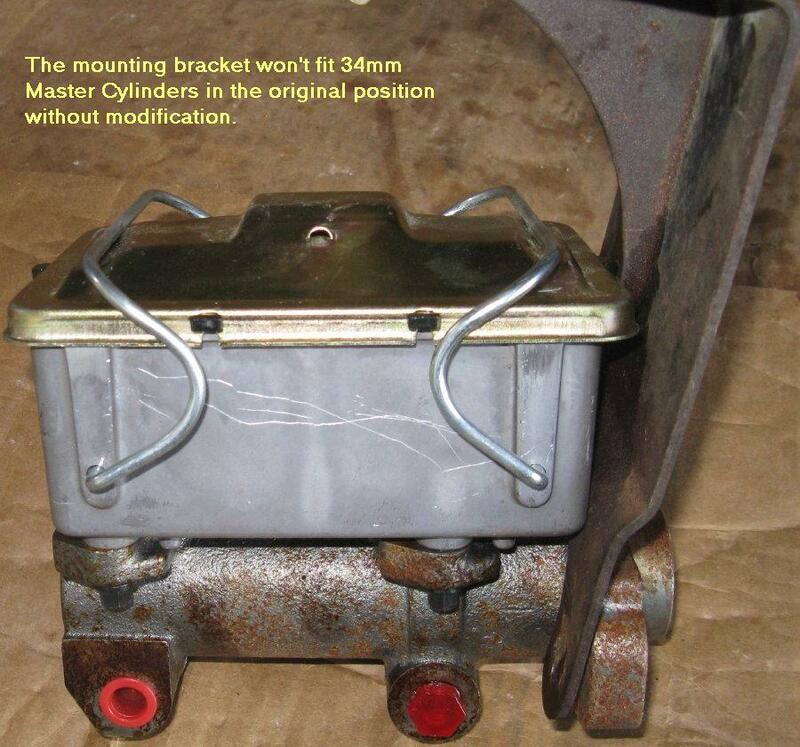 You will also have to lengthen the pushrod to compensate for the thickness of the bracket. (You should test the pushrod length any time you replace a master cylinder, even without bracket changes.). 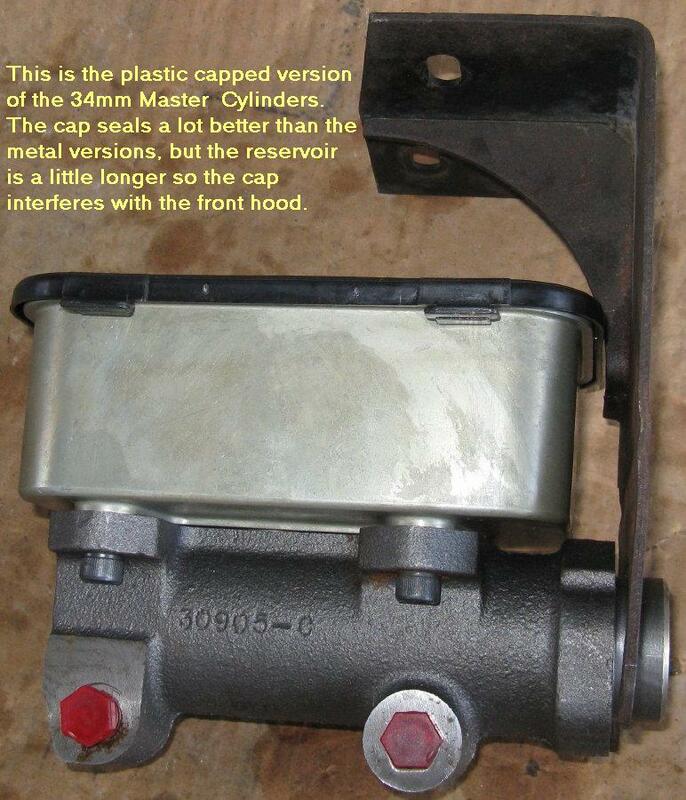 I found there are two versions of this master cylinder, one with a plastic cap, and one with a metal cap. The plastic cap seals much better, but is difficult to install and remove to check the fluid. More importantly, the reservoir is a little longer and protrudes enough that it interferes slightly with the closed hood door. It will work, but the door may have to be shimmed out a little. The one in this picture is a Bendix 11641. Unfortunately, there doesn't seem to be much correlation between the picture of the unit you order and what you actually get. Other numbers to try are Autozone/Cardone 10-1668, ACDelco 174834, Dorman M39309, or CarQuest 20-2234. There are several different configurations available, so make sure you get one that has a short, compact body so it will fit behind the hood. The cross reference is GM part number 14009146, or a 1979-1995 GMC/Chevy P30 or P3500 van with all wheel disc brakes. NOTE: The original master cylinder had the rear brake lines coming off the front reservoir. The 34mm type master cylinders have the rear brakes attached to the rear reservoir. The difference is in the size of the fitting where the brake lines attach. You can either bend the brake lines to reverse where the front and rear lines attach, or use adapters on the brake line fittings. The fittings are usually 1/2"-20 and 9/16"-18. See Autozone BLF-21C and BLF-26C. Whenever you replace a master cylinder, even with the same size unit, you should test and possibly change the push rod that goes between the master cylinder and the brake booster. The rod sits in the center of the vacuum booster and can be pulled out once the master cylinder is removed. If you've moved the mounting bracket so it's between the master cylinder and booster, you'll also need to add 1/8th inch or so to make up for the thickness of the bracket. You want the rod to have slight clearance so that the brakes don't drag and the master cylinder piston can move far enough to release the pressure applied to the brakes. If the rod is so long that the piston can't retract enough to relieve pressure, the brakes will apply more and more with each stop until you can no longer move the vehicle. If the rod is too short, the pedal travel will be too great, the usable piston volume will be reduced, and the brakes will feel mushy and unresponsive. 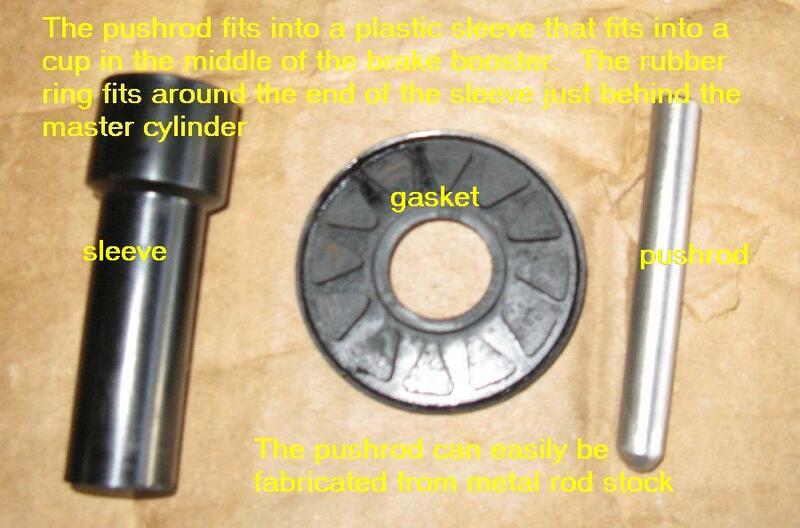 The push rod can easily be fabricated from steel rod stock. The end of the rod that goes into the brake booster sleeve is flat, with a slight chamfer of the edge so it's not sharp. The side that fits against the master cylinder is rounded so that it seats properly into the conical depression on the back of the master cylinder piston. I added an additional rubber gasket (not shown) cut from gasket material to the same diameter as the original gasket to make up for the thickness of the metal bracket. This may not be needed. Be sure to test the pushrod length. 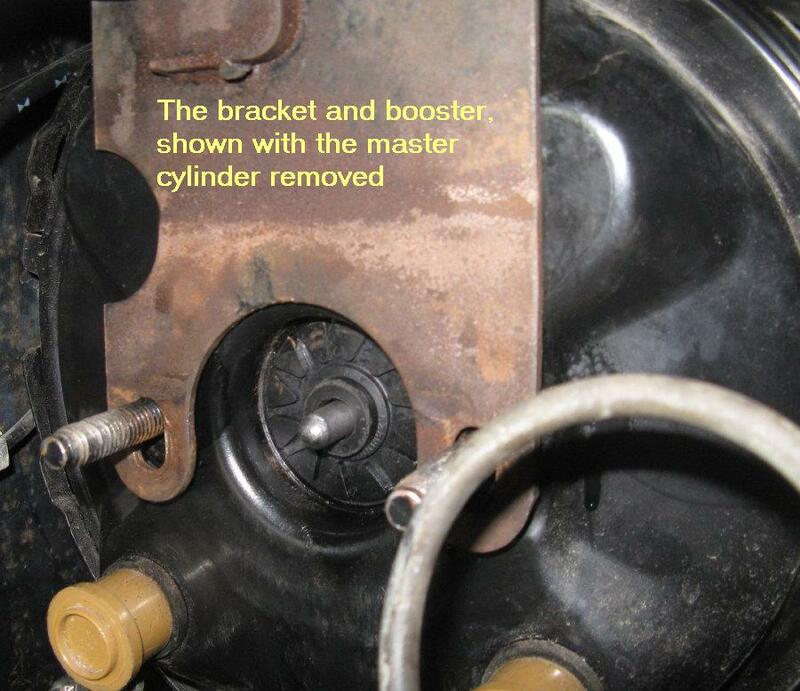 Even if you install the same size and type of master cylinder, the old pushrod may not have been correct or there may be differences in the new master cylinder. There are lots of tools and techniques for testing push rod length. Probably the cheapest way is to install a rod that is close to the right length, put a dab of modeling clay or plumber's putty on the end, and install the master cylinder. Then remove the master cylinder and examine the clay. There should be a uniform depth of clay on the end of the push rod, about 1/2 mm thick. If it's too thin, grind off the end of the push rod a little more. If it's too thick, install a longer rod. The clay method can be a little fussy to get right, so Ken Henderson designed a simple tool for making the task easier. For details, see Ken's write-up on the GMC photo site here. Be sure to torque all the mounting bolts for the master cylinder bracket. The loads applied to this bracket are substantial. Torque the bracket bolts at the upper firewall to 15-20 ft-lbs. Torque the two nuts holding the master cylinder onto the booster to 28 ft-lbs.